Part of the reason for my being a little quiet here; we got nailed by severe thunderstorm winds a bit more than a week ago. Like really severe; at first we were wondering if it was a tornado that hit. I was inside the Little House with Smidgen, watching it come; no warnings severe enough to send us down into the cellar. It was really, really, impressive. Saw some big trees bending- double. Then they broke. We've been spending a lot of time cleaning up; all the paths and roads in the woods have major trees down on them. And it keeps raining too, have you noticed? 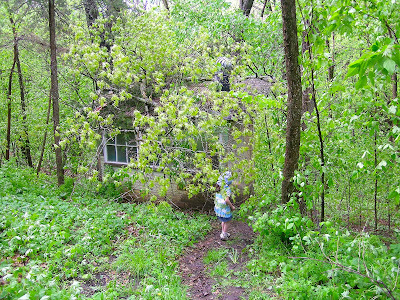 One of the major hits- a couple of big oak branches came down right on top of the THWASPCO (That's "Three Hole Wind And Sun Powered Composting Outhouse" for any uninitiated.) That's Smidgen, walking down into the tangle right after the storm, investigating the damage with me. It got clobbered. There was a big (5" thick) oak branch poking right through the roof; and even a 2 foot long section of 4" thick branch right inside on the floor- after having made its own hole in the roof on the way in. There are these hazards to living right in the woods. We knew it. In 30+ years, though, this is the first time we've had a building damaged by trees. A new roof for the outhouse was not on the list of chores we'd been looking at; and also not in the budget. Why the Universe feels it has to constantly be testing our resilience, I do not know. But it sometimes seems to be the Universe's favorite pastime. Before the storm, we were wealthy. We had a permanent place for our poo. No worries; it goes there, rain or shine or snow, and it works. Then, suddenly we were without a pot. Well, without a roof for our pot, anyway. The basic structure was not damaged; we'll need new translucent fiberglas roofing (which, at 30 years, actually needed replacing anyway) and I think a purlin or two got cracked, but that's all. With all the "spring rush" going on- wet soils like everywhere else slowing it all down- I'm guessing we'll be looking like a blue-tarp refugee camp for a while; maybe until autumn. We'll have to scare up a few dollars- and harder, a few days worth of time to get it done. I mean, really, Universe. Was that necessary? Weird, but effective. I was thinking of titling this post "Finally: A Federal Agency That Knows How To Communicate!" - but then I figured, why not follow their lead? 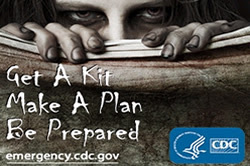 The Federal Centers For Disease Control And Prevention, the CDC as it's known, has put out a highly popular and well twittered post on "Preparedness 101: Zombie Apocalypse." And with considerable éclat and humor, they go through the various prepper actions any household should be familiar with, in order to be truly ready, when the flesh-eating zombies take over. They do make it clear fairly early on that no, they don't really believe in zombies; but in fact the list of preparedness items applies perfectly well to disasters like, oh, floods, tornadoes, tsunamis, nuclear meltdowns, and hurricanes. If you think about it- the fact that my scrounging around for any kind of positive news to post about here, since we're fed fat with disasters and who needs more depressing stuff today; and this was the best thing I could come up with- kind of tells the tale, huh?